MangaHelpers > News > Interviews > Reviewer Interview: Take You Chances with blackjack612!! Reviewer Interview: Take You Chances with blackjack612!! Hello MH! It's exciting to be here, especially with everything that is going on. The Bleach Tournament and MH Anime Awards reached their climaxes, the Naruto Tournament is revving up, and we just opened up a brand new section, featuring Korean manhwa. This interview is pretty exciting as well, because this time, the conversation partner is not somebody who is a long time member or long time reviewer. But he is a STAR and he just started submitting his reviews, and he is doing a fantastic job as well. 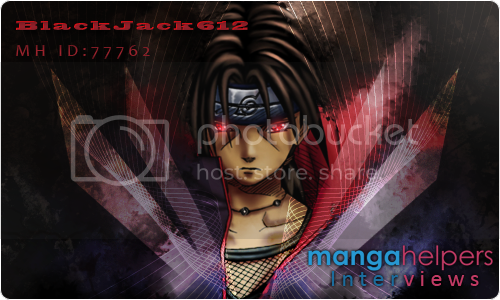 Please welcome blackjack612, a Naruto reviewer. Speaking of fantastic jobs, he's not the only one, because as you can see, we have some great artwork given to us by ~coffee~! Thanks for the banners! Hi blackjack and welcome! Please say a few words about yourself and the history of your relationship with MH. Hello, I'm a 21 year old computer science student at UIUC. I've been watching anime for 12 years now, and eventually I started watching Naruto. And that was in 2005 when Naruto started airing on Cartoon Network. I remember because Adult Swim had started to decline in quality about that time. When the Naruto filler started, I started reading the manga. Then I started reading manga a lot and picked up Bleach three years ago on a recommendation. That's pretty much when I started lurking MH to read discussions people had about the latest chapters. I'm pretty shy though, so it took me a while to join. You did really well to join, thanks for coming! So do you have any interesting hobbies besides manga? Besides manga, I read books and comics, and I love film. I also draw, write, cook, and travel. Films and cooking are probably my two biggest hobbies. Nice list, I especially like the drawing and cooking part. Do you know that we have a Cooking Corner on MH? You can submit your recipes there. As for drawings, did you ever consider submitting fanart or maybe signatures? There are sig contests or just general art submissions, and pure drawings would be a cool idea and contribution. Really? I'll probably be adding a few recipes there later, and about submitting art... Maybe, but only as a passing fancy. I'm very critical of my own work, and since I've been in college, I've not drawn as much as I used to. I'll doodle during class or occasionally when inspired. In fact, I think a lot of my class doodling is Naruto related when it's not my own work. I see. Now let's enter the subject of writing. How did you decide to review and why Naruto? I had actually thrown around the idea of reviewing for a while. Besides MH, I read a lot of reviews at avclub.com/channels/tv or at Ebert's website. I really wanted to try my hand at reviewing myself. Originally I wanted to do Bleach, because at the time, it stuck with me most (of the Big 3). However, The Underscore's reviews are really thorough, and the new arc hasn't really gotten underway. I see. Ever considered OP? Because there were two people already reviewing it when you started. I only recently started reading OP last semester. So my thoughts on the series haven't had time to mature. But with Naruto, a new arc had started and there was so much one could choose to write about with all the mythology building going on. But really, the quality of the manga was on too much of an upswing to not choose Naruto. I see. Well I congratulate you on the choice. About the upswing... Many people disagree with this, so I’m glad you mentioned it. Let’s address a few of these. The first question doesn't really relate to the current arc: How did you find the timeskip? Improvement or setback? Many people consider that it's harder to relate to certain characters in Part 2 and that characters that received interesting development in part 1 were poorly developed in part 2. I think it was an improvement. The characters in the early part of the manga were still young, inexperienced shinobi and they needed time to train. They're younger in Part 1 and so there motivations are purer, but I for the most part I like how they developed during Part 2. Of the rookies, I only really had a problem with Tenten and Ino, but I came around on Ino with the recent chapters and I hold out hope for Tenten. Really though, as entertaining as the manga was in part 1. I was more emotionally invested in part 2. Second problem that was raised during part 2: The Sasuke saga. People said the manga should be named Sasuke. Do you think that it was worth it considering the screen time that was given to him? I don't want to sound like a Naruto apologist. I can understand how people who weren't fans of Sasuke would be frustrated with his emphasis in part 2. However, I think it was worth it, because Sasuke represents the opposite of Naruto and defines the character in similar ways to how the Joker defines Batman. You have two characters who are very similar, but respond to their trauma in completely different ways. That, and it gave us more Itachi, which I'm all for. Haha. Now that will get you some fangirls probably :p But, interesting comaprison there. Probably the first time I've heard it. The third thing is related to the war and it concerns the infamous Edo Tensei spam, so I would like to hear what do you think what are the advantages and disadvantages of the current ET usage. The biggest disadvantage is that too many characters are helping the allies. Not only does this make the use of ET seem almost pointless for specific summons, but it makes Kabuto seem ineffective. Kabuto's strength so far has been his intelligence. The man came up with a plan to ensure that Madara Uchiha accepted him as an ally, yet he's being outsmarted by his own jutsu? The biggest advantage is for Kishimoto. By bringing back unfamiliar characters also, he gets a chance to very naturally expand the mythology of the manga. The mythology was always one of my favorite parts of the manga, and the war has greatly changed how I perceive ninja history. And old characters like Asuma get a chance to show why they're renowned. I see, now the last issue is about the war. You mentioned that you read the Big 3 right? And there were wars or big battles in all 3 so I would like you toe compare these wars. But let's break it down, so we can have a coherent discussion which war looks like a real war? I'm going with Naruto, with One Piece coming close. I say Naruto because we're seeing the stages of a real war. War also means casualties, do you think that the lack or low level of casualties is a downside of the manga? Hmm. One Piece has been the most willing to let it's main characters die. But I don't think low level causalities is a downside. If a war is going on, I don't expect main characters to die, just as long as some casualties occur. In that regard, I think OP has the most realistic battle. But as for war, in Naruto we see the initial disagreement between Madara and the Five Kage. After the declaration of war, we see both sides preparing. And in the middle of multiple battles, both sides readjust their strategies to adjust to real time conditions. So in that regard, I think Naruto contains the most realistic depiction because the scope of it's war is large. But I think the fundamental difference is that they each use war to focus on separate issues. In Bleach, Kubo is using war to highlight the human existence and humanity. The central theme of the Arrancar arc was death. Each Arrancar represented a different aspect of death, and that was really what the main character's were fighting. Ichigo overcame Ulquiorra's nihilism. Soifon had to confront her own fears of death and aging. Kyoraku and Ukitake offered an alternative to Stark's loneliness, and so on. I felt Harribel's theme was underdeveloped. However, it could be that she was just as willing to sacrifice herself for Aizen and the sake of hollows just as quickly as Hitsugaya was willing to sacrifice himself if it meant that Aizen died. Some characters rejected what they confronted. Others paralleled. I see so what about One Piece and Naruto? What are the big themes concerning them? War in OP tackles much broader issues. It's concerned with society and justice. Does might make right? Is justice attained by unjustifiable means still justice? OP features cover-ups, corrupt governments, classicism, and slavery. One side is willing to get it's hand dirty for justice. One side is willing to dirty it's hands for freedom. Luffy and his crew attempt to find a better way. In that battle with the Whitebeard Pirates after a couple of the more noble characters died, the battlefield quickly devolved into chaos and intentions were misplaced by carnage. I think the frantic pacing of the battle underscored how quickly the world goes awry when the means used are questionable. Interestingly, Naruto uses war to dissect war. That is the one issue at the heart of the manga. How many characters had tragic pasts scarred by war? Naruto's parents/sensei were taken away violently. Sasuke lost his clan because the Leaf sought to prevent civil war. The Chuunin Exams would have been the mere prelude to war if Orochimaru has succeeded fully. Let's not forget that these characters were still children when they entered their first battlefield. You mentioned some very cool points there. Now that we have mentioned several titles besides Naruto, do you read anything besides the big 3? Pretty interesting combo. Do you think you will have the time to submit a review or two for these titles? I'm not sure. I'm a big fan of Urasawa, so I might start doing a Billy Bat review. But with the others, the publication is so sporadic that there are large parts of say Air Gear or Vagabond that I've read and enjoyed but that I don't remember much of. Would you like to see one of these series reviewed by somebody? If yes then which one? Vagabond, mostly because the text could benefit from supplemental material. There are sections of Vagabond that go more deeply into Zen or Buddhism or actual martial arts theory. That's a big undertaking for anyone the main reason for the difficulty is to actually sit down and write the review. So how do you find the patience? Well, I actually like writing up the review. It's finding the time to do so that's difficult. I underestimated how much goes into writing one, but if I finish a review in 4 hours, I consider it quick. How do you write them do you have a certain technique, are there any specific stuff that might benefit a beginner?If that said beginner wants to start reviewing? I read the chapter first for a first impression. Then, before I do the writeup, I go through a second read through, during which I choose the panels. I try to break the chapter up into segments based on the panels such that each segment only encompasses a few points. I don't want to overload the reader by making too many points with too few references. For anybody who is not familiar with your reviews, let me mention that blackjack has a section where he chooses different parts of the text and quotes them as being memorable. So how do you choose the quotes? I choose quotes that I personally find interesting. Things that maybe sum of themes or the tone of a chapter. Maybe something that I thought was really well phrased. I'm a sucker for well chosen words. My favorite quote from Naruto is still the one from Itachi, where he says, "You shouldn't judge others based on their appearances or your own misguided preconceptions." Before the reveal, there was a lot of speculation about whether Itachi was a villain or not. I was never convinced he was a villain because of those words. Let's continue in a more general register, okay? First of all, what do you think are the main qualities of a good reviewer? The ability to empathize with all of the characters, or if you have a bias against a plot point or character, to constructively criticize it. How important is to cover every single element in a chapter? Because in the case of shorter reviews that's probably impossible. Not terribly important. I don't think every single element should be covered, but the elements the reviewer feels were most important. And this will change person to person. So should I take it that you value the subjective more then the objective? I guess. I think a review should be more than just a recap, there should be something subjective there. But there are so many things once could analyze and different people read different things from the same chapter. For example, I tend to put a lot of emphasis on characterization, mythology, and story arcs because those are the elements I'm most interested in. I'm not too upset when a chapter is light on plot development, so long as it ties well into the larger mini-arc. Well, consider Bleach. A lot of people complained that the Arrancar arc was overly long. But as a reader, I was more concerned with the mood of those chapters than the plot advancement. Ulquiorra's battle took up a few chapters, but it was worth it to me to see that character try to impart his world-view upon the main characters and have him grapple with the existence of something beyond his ability to see. That's a really interesting comment, I never really thought about that from Ulq's perspective. You just recently started writing reviews. Are you planning on improvements on the format or approach maybe change some stuff? Do you have anything planned? I'm always taking suggestions. After eight reviews, I'm still settling on a style. For a while I hadn't settled on a tense to use for describing the chapter's contents. Anyway I don't have anything new planned right now. Well I can suggest something that I think every review lacks and maybe certain ones just manage to touch the topic and that is the art and considering that you have experience in drawing you might have some expert opinions I for one would really appreciate that things like details paneling flow of the movements etc. Apart from that, my next question is: How do you decide on the rating? That's a good point. These last couple of chapters in particular I was thinking that. The five star scale evolved from how I rate music in my library. 1 - The chapter has little to no redeeming value. I wouldn't bother rereading it. 2 - The chapter has some redeeming value. But there are far to many negatives bogging it down. 3 - The chapter was readable and competently done. I didn't like it strongly, but it mostly worked. 4 - The chapter was of above average quality. There might be some minor weak spots, but overall the chapter is entertaining. 5 - Classic chapters. I might have a couple of caveats, but the chapter is a high point in the manga. So I determine a rating on how much above or below average a chapter was. Speaking of which, what chapter would you rate as Kishimoto's best? And which chapter did you enjoy reviewing the most? Hmm. I enjoyed reviewing Chapter 525 and 531 the most. 525 because I found the former Kages fascinating and 531 because that chapter was really poignant. For the first question, am I considering all Naruto chapters or just the ones I reviewed? My favorite chapter of Naruto is number 222 in which Itachi is confronted by his clansmen in the police force over a suspected murder. Before recent revelations, Itachi was assumed to be pretty villainous by majority of the Naruto readership. And read in that way, chapter 222 enforces that perception and provides the motivation for Itachi's fall from grace. Our preconceptions of Itachi's detached arrogance and cold demeanor towards Sasuke, colored how we view the situation. But the same chapter also serves as Kishimoto preparing us for future twists, warning us that we shouldn't judge situations based on their appearance and our own preconceptions. Read in the context of the Uchiha rebellion, the attempt to arrest Itachi becomes tragic rather than foreboding. The key here is the precise wording of Itachi's dialogue through which Itachi subtly reveals the facade of his public image. What exactly is he referring to when he says, "It is foolish to fear what we've yet to see or know." Is he hinting at his mastery of the Sharingan, or is he pleading with his clan not to preemptively attack Konoha based on the assumption of a coming civil war. What "duty" is he carrying out? Duty to his clan? Duty to his village and Hokage? Duty to the cursed and ambitious blood of the Uchiha flowing through his veins? The wonderful thing about this chapter is that it can be read so many ways. Wow. That's an analysis worthy of ones favourite chapter. Thanks for this, and I'm sure everyone who is reading this interview appreciates it as much as I do. Speaking of readers, do you have any messages for them? Take the opportunity now that you're on the Front Page to convey anything! To the readers, the issue of whether a currently serialized manga is going downhill or is in an upswing can be a divisive and spirited discussion. But in the zeal to bash or defend the latest chapter of Naruto or Air Gear or whatever, I think people sometimes judge a series as a whole based on the incomplete impressions the latest releases leave. Just as a TV series plays differently when consumed quickly on DVD rather than when it's watched live week to week, a manga series sometimes can read better or worse when collected and completed. As an example, take chapter 222 of Naruto that I mentioned earlier. At the time, there was a heated discussion on just what to make of his character. In that case, incomplete information and genre cliches and trends informed our preconceptions of a particular character and so what followed and what we thought should follow were vastly different. It happens. So the next time you aren't sure what to make of your favorite series, give the latest arc or maybe the whole manga a reread when it's completed. It just may read differently. Anyway it was a pleasure to post this, I hope you guys enjoyed it! Mata ne! Superb interview. From the moment I started reading the great conversation I was hooked, and at the end I was left with a craving for more. If you're a person that likes reviews, or in-depth discussions about manga in general, then this is a guaranteed good read. Interesting Interview. The banner looks neat.